Featuring a comfortable and efficient handle that is made entirely of recycled material, this CobraHead® Weeder and Cultivator will not only be your good assistant whether you are left-handed or right-handed, but also is environmentally friendly. The time proven blade design is able to break up and plow almost any soil. 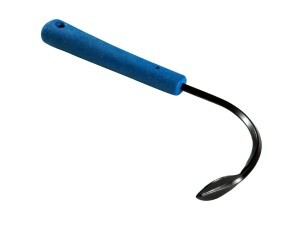 This CobraHead® Weeder and Cultivator has gained a large popularities. It is a great gift for gardeners. It does a good job weeding, cultivating, scalping, edging, digging, furrowing, planting, transplanting, de-thatching, and harvesting. The comfortable and efficient handle makes it suitable for both left-handed and right-handed. This unit is great for the garden, and is able to get most weeds out by the roots. Quite efficient. The sharp head and curved neck penetrate even the hardest, driest soil. And flat sharp head easily loosened dirt. Makes you weeding much easier. It is a versatile, durable, comfortable product. Solid construction and comfortable hand grip. You may need to kneel, squat, or sit down when uses this unit. Cutting tip is a little bit too small for some people.